Sunday 21st June was a great day for me. With one walk I completed my Local 100 hills, and also completed my nationwide 200th summit. My 100 local hills (as defined on MV) are spread across 8 counties – Dublin, Wicklow, Wexford, Carlow, Meath, Cavan, Louth & Offaly. So much for local! I had planned it so that Croghan Hill in Offaly would be the final of the lot. This is because I was quite taken with the notion of it being the most isolated hill on MV (32kms from the next nearest hill in the Slieve Blooms). The Local 100 have ensured that I visited hills and places I might never have bothered with. The spirit of exploration has been strong as I discovered previously unheard of hills. By exploring these I discovered fantastic new views (Slieve Boy, Carriglineen, Cornasaus), new pain endurance levels (Collon Hill, Barranisky, Carrick Mountain) and new curiosities at summits (Baltinglass Hill – massive intact ringfort, Slievecorragh – lonely Teddy on Dan Clancy’s chair, Tara Hill – intact benchmark plaque on the side of the trig pillar). There were plenty of run of the mill hills with little to offer in the way of excitement – Clogrennan, Clermont Cairn, Slievefoore. But exploring these new places was excitement enough in itself. Often, apparently innocuous hills turned out to have fascinating history or mythology attached to them. Mount Oriel – the High Man, Croghan Hill – St Brigid, Carnavaddy – Cuchulain’s dog Bran. 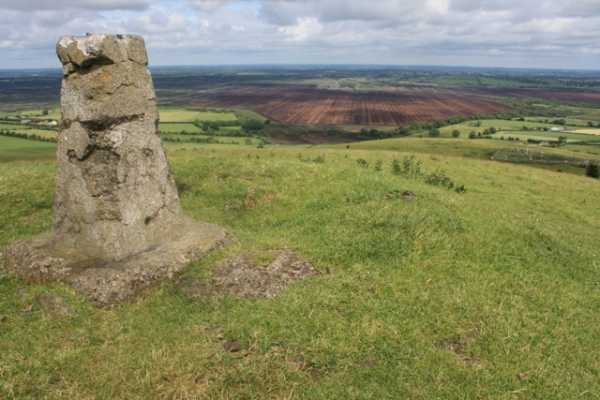 If I had to recommend just one of my Local 100 for others to visit it would have to be Croghan Hill in Co. Offaly. The views far across the land are stunning from this lonely height. It really sums up all that can be offered by the multitude of baby hills that are out there waiting to be visited.